Stevie Nicks revealed that even after all these years in the business, there are still three people she's been dying to work with. Nicks, who last night (August 9th) wrapped her joint dates with Rod Stewart in Houston, just announced two new Florida stops for September, hitting Saint Petersburg on September 24th and Saint Augustine on September 25th. Nicks told us that she's waited 40 years to share a stage with three distinct singers: "Well, when I moved to Los Angeles with Lindsey (Buckingham) in 1972, I wanted -- there were three songs I wanted to sing two-part harmony with; Paul McCartney 'Yesterday,' James Taylor 'Fire And Rain,' and Elton John 'Your Song.' I've never gotten to sing any of those three songs with those three men! So, I'm still looking that maybe that will happen someday. Because that was before this happened, y'know? That was like way before we were famous." I'd rather hear Stevie's unreleased duet with Sting that they recorded for THE WILD HEART! May all your wishes come true stevie!!! Pail would be lucky to get to perform with stevie ! 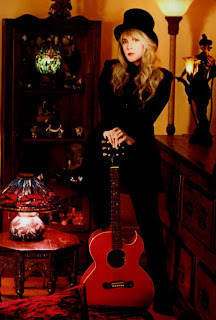 When I saw her at the Grammy Museum she said she would love to do a song with LYLE LOVETT...That impressed me,because he is an amazing songwriter...What happened? I would SO love for her wishes to come true with all 3 of these awesome performers! LOVE them all, and in answering this same question, one of the performers I picked was Elton John! I'd LOVE to hear her with all of them! PRAYING for this to happen!! "It's a little bit funn-naay!" Would love to hear all of those duets! I'd rather hear her duet with three fellow legendary female rockers....Ann Wilson, Grace Slick & Linda Ronstadt! I love all those so COME ON! didnt she record some songs with Billy Idol back in the day?? that would be awesome!! LB and make it a tour! I second that buckingham & nick gig!! !